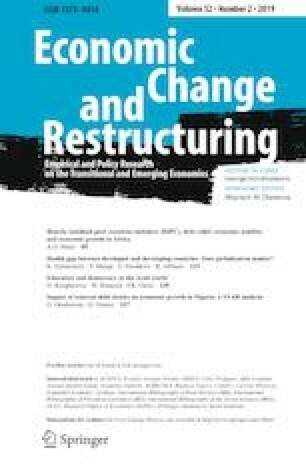 This paper uses a structural vector autoregression generalized economic growth model augmented with a debt variable to characterize the dynamic impact of innovations to external public debt-to-GDP ratio on per capita GDP growth, investment, trade openness, exchange rate and inflation in Nigeria over the period 1970–2014. Using Blanchard and Perotti (Q J Econ 177:1329–1368, 2002) identification techniques to arrive at economically interpretable variance decompositions and impulse response functions, the results show that external debt shocks have long-lived negative impacts on economic growth and investment, as consistent with the debt overhang hypothesis. Moreover, innovations to external debt were found to have short-lived positive impacts on inflation, negative impacts on trade openness, but insignificant effects on the exchange rate. The implication is that attainment of sustainable levels of economic growth and external debt is guardedly sketchy at the moment and could remain elusive if aggressive measures are not undertaken at reducing the debt burden, encouraging domestic savings vis-à-vis domestic investment, and channeling borrowed funds towards the provision of basic infrastructure and goods that would not inflate the economy or hamper external competitiveness but, rather increase the level of economic activities and improve the well-being of citizens.